So if you follow me on Instagram, then you know that yesterday I was having a bit of a color conundrum myself. Okay, so maybe it was a "conundrum", per se, but I was having a tough time choosing between these two necklaces! And so I asked for your help! Which one did you like best, I wondered? And the response was mixed. Some of you guys really liked the mint and pink, but the majority of you guys loved this coral and cobalt mix. I had such a hard time deciding which one to buy. I personally loved the cobalt and coral for Summer, and I loved the pink and mint for Winter and Spring. And so I did what any girl would do...I bought them both! But it got me to thinking. About color and how you can totally find inspiration anywhere you look. And so to prove it to you guys, I decided to use this necklace as inspiration for a wedding color palette. And so off to the drawing board I went... and here you have it! A perfect-for-Summer look that, truth be told, has me wishing I could have a "do-over" wedding. So what do you think? Are you liking the way these colors work together? I've incorporated some beachy patterns to give it a pretty, Summer feel. And I couldn't love it more. 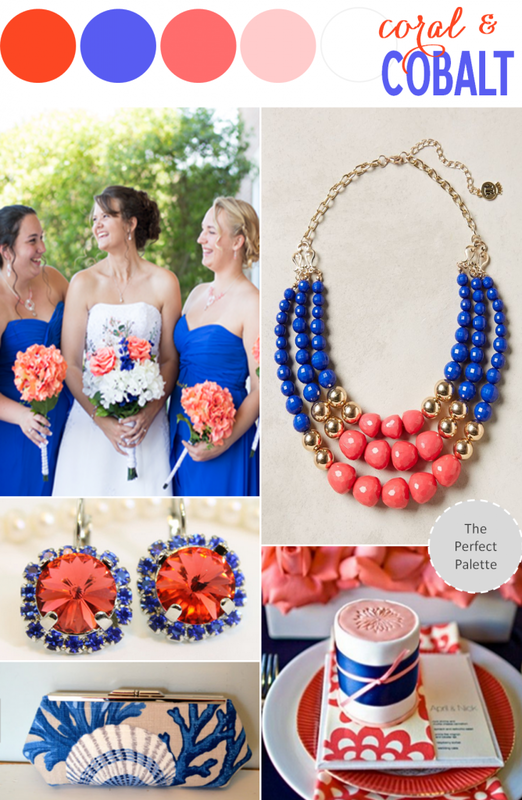 8 Comments " Color Story: Coral + Cobalt "
Absolutely yes! Love this bright and fun palette! What great inspiration! I was loving both of them too. This is such a rich combination! oh wow! is it weird to say that I'd forgotten about cobalt until this post? Such an awesome color. Stunning!! Colors.. Blue and Red.. Beautiful..
Great color combo--full of unexpected fun! Go bold with Cobalt Blue! Luv it! What a fresh and bold color palette! I love the bold shapes and textures as well!